We previously reported on the fact that MKX will likely be getting micro transactions but we didn’t know exactly what they were going to be or whether it was going to be purely cosmetic purchases or the more nefarious pay-to-win option? Well I have good news. It is definitely not pay-to-win but at the same time it isn’t purely cosmetic either. According to screenshots posted by ThisGenGaming the following micro transactions have popped up in the PlayStation store. I have absolutely no problem with cosmetic micro-purchases but I’m normally against any purchases that affect gameplay. A fatality is theoretically game play but really it’s just a cool way to finish a fight after the match is over so again I really have no issue with that. Unlocking all The Krypt items is pretty pricey but then again the only other way to do it is to grind through The Krypt and I’m really not a fan of grinding game play. 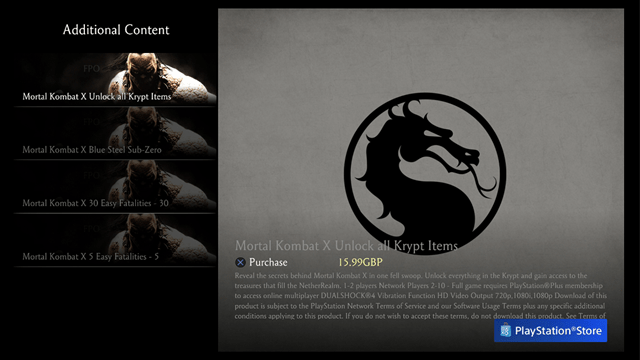 The items collected in The Krypt also do not affect game play so I feel NetherRealm have done a great job in implementing this. I’m hoping to grab a copy of Mortal Kombat X on the PlayStation 4 today. Which platform are you planning on grabbing the game on?